Stacy Horn » Blog Archive » Well, yesterday sucked! Thank god, that’s over. Let’s see what today has to offer. Meanwhile, I took a picture of one of the places I used to live. I’ve lived three places in the last 30 years, all within blocks of each other. 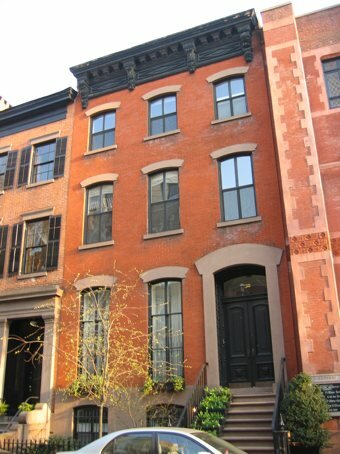 This is the first place I lived when I came back to New York from Boston — 230 West 11th Street. That’s in the village, which I’ve never left. I lived here in the top floor with my husband. Then I moved (alone) a few blocks down on the same street. Maybe I’ll take pictures of the other two places today. I loved this place though. It had a fireplace, a skylight in the bathroom, and wood floors with very wide planks. It had a country feel. Oh, and we had access to a beautiful church garden. I should scan photos I took of that. I went nuts photographing that place. I was a photographer when I first started out as a working adult and that place was all wildflowers and overgrown, and not perfect and ordered and cultivated. It was enchanting.